Ultimately it seems that some of the greatest art in the world concerns itself on some level with the forces of Nature, and Nature itself is part of Place. We are always fascinated by work that speaks traditional languages in individualistic and idiosyncratic ways. The bark paintings and acrylic contemporary works by Aboriginal peoples of Australia are very good examples of this. Filled with the inherent powers of the Dreamtime they also engage on an aesthetic level of abstraction enhanced completely by individual vision and creative process. 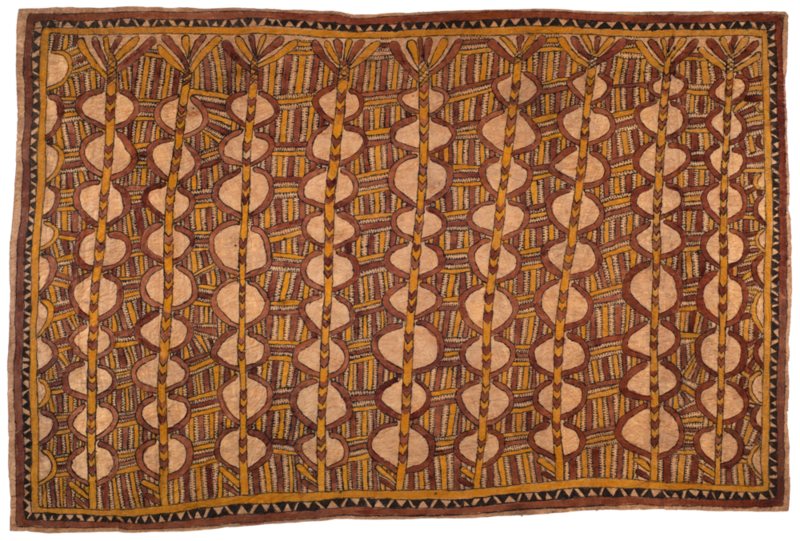 It is this spirit of indigenous vision that speaks so eloquently to our Western eyes that compels us to present these dramatically arresting works on barkcloth called nioge by the Ömie people of New Guinea. The same eye, the same hand, the same intentions govern the imagery whether made for personal use or to be sent out into the world as emissaries of self-pronouncement and survival. They are like music, like songs. They are sung indigenously but are shaped by the personalities and styles of their individual makers. Here is the title of one drawing in the exhibition by Fate Savari: Ceremonial white shell pendant necklace (with spots of the wood boring grub, women’s white seashell forehead adornment, boys chopping tree branches, small white plants that grow on mountaintops, old animal bones found while digging in the garden and beaks of Blyth’s Hornbill). The subjects come from the landscape, the inner poetics of inner and outer Place. The women sometimes refer to the images as their “wisdom”, and selectively reveal the intrinsic meanings to outsiders. One of the earlier appreciators of the Ömie, Drusilla Modjeska, wrote: “When the alphabet of motifs can be named, it is absorbed in such a way that parts do not require naming. The iconography works not by being broken into separate elements, but by a complex patterning of sensations and image that is not translatable--a way of seeing that is affective as well as instructive.” The nioje are a manifestation of the tribal homeground, an extension of self and culture and place. This can be expressed as in the descriptive title of a barkcloth by Mala Nari; Ömie Mountains, eggs of the dwarf cassowary, river stones, and tattoo designs of the bellybutton. Nari had a deeply dramatic vision in 1996 that led to the revival of these never-forgotten designs and codifications of history and experience. Cavin-Morris Gallery is proud and pleased to announce the collaboration with Ömie Artists to present these profoundly beautiful paintings. We will show the widely differing work of fourteen women and two men of the Ömie people. Most of the barkcloths are created by the first generation of duvahe or chiefs of the Ömie as a way to remember, and in an effort to revive this imagery.